Beets may not be on your radar for beauty but its unique properties may just make it the “it” ingredient for beautiful hair. Sugar beets are a form of beet of the amaranth family. There are four types of beets that are grown for their edible leaves and roots: the garden beet, the Swiss chard, the mangel-wurzel beet, and lastly the sugar beet, which is a major source of sugar. Sugar beets, which are white, were developed in Germany in the 18 th century. It is capable of accumulating up to 22% sucrose in just its root and the sugar beet accounts for roughly a third of the world’s sugar production. Sugar beets are grown from seeds and sown in soils ranging from sandy to heavy clay. They grow between 2-4 lbs. and harvesting starts in late September to early October for summer crops in the warmer regions like Africa, South America, the Middle East, and southern Europe. 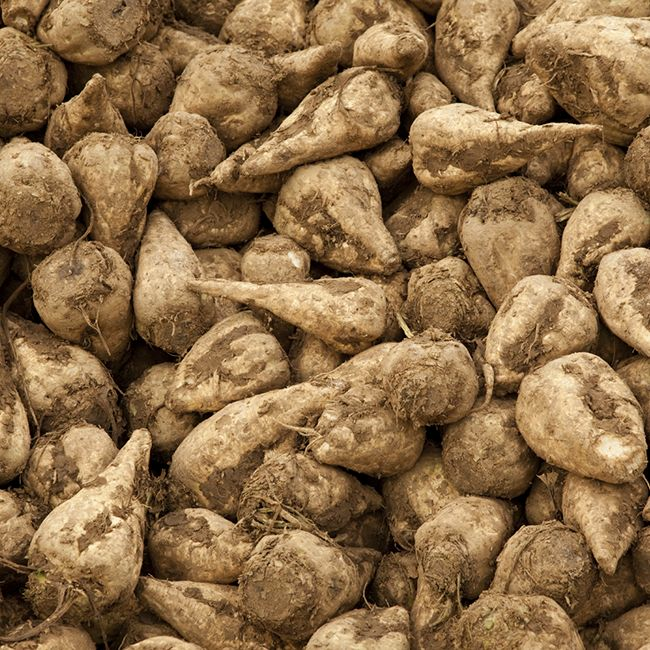 Sucrose form sugar beets are the principle use for this particular beet in the United States and sucrose is widely used as a pure high energy food or food additive. When it comes to hair, while traditional red beets have been used for dying hair red, sugar beets are white and not utilized in that way. Instead they have other beneficial properties that make them a must-try ingredient for hair. What's the difference between sugar cane & sugar beets? Refined sugar can be made from both sugar cane and sugar beets. but they are different plants with unique chemical compositions along with growing in vastly different environments. Sugar or sucrose is naturally occurring in every fruit and vegetable, but most of the sugar in the world comes from either the sugar cane or sugar beets. Despite their similar uses and the easy ability to extract sugar from both of them, sugar beets and sugar cane are not one in the same. Sugar cane is a tropical grass grown in warm, moist climates and harvested by burning the leaves from the stalks before cutting them down. Sugar beets are grown underground and harvested from the ground before being washed, sliced, and put into a diffuser where water helps in extracting the raw sugar juice. Although not a good source of protein, they do have fiber, vitamin C, iron, and calcium. They also have a high content of silica, a trace mineral, which is ideal for healthy skin and scalp. It helps to strengthen blood vessels and improve circulation, which stimulates the blood flow to one’s scalp and encourages hair growth. As a vital component to skin’s connective tissues, it fortifies your bones, hair, and nails. All beets have betaine and it is the primary nitrogenous component of sugar beets. Betaine is an amino acid that acts as a humectant and anti-irritant when in cosmetic and hair products. Its composition allows it to retain moisture and give superior hydration without annoying stickiness associated with some glycerin-based products. Betaine gives skin (scalp) a hydrating calming effect that is ideal after using a harsh exfoliator that may cause irritation. While sugar beets are more often utilized as a sweetener than they are as hydrating, anti-inflammatory and anti-irritating beauty products, there are some products on the market that harness their goodness for hair.